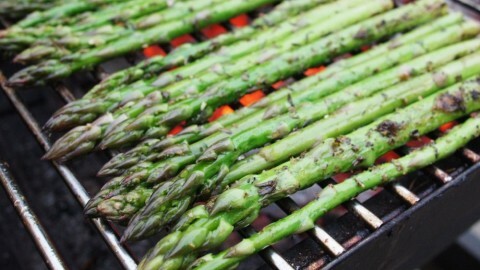 Asparagus and grilling are two of the great pleasures of the late spring and early summer. And the one, it seems to me, was made for the other. Now don’t get me wrong, I like asparagus pretty much any way you want to serve it to me. Its sweet-bitter flavor, its soft-crunchy texture, have long made it a favorite vegetable of mine. And it doesn’t hurt either that it requires so little prep-work to get it ready for the pan. But grilled asparagus, I think, is special. It’s like grilled eggplant — a delight we’ll get to later in the summer — that way. There’s a kind of smokey magic that permeates the vegetable, that chars and crisps it on the outside, leaving a finished product that seems both raw and cooked, both thoroughly itself, and thoroughly transformed by the heat. If you’ve been reading Twice Cooked for long, you’ll know that summer isn’t exactly my favorite season. That, as I said elsewhere, I kind of wish that it were always winter, and never Christmas. But this recipe — or this sort of recipe maybe — is where it gets all complicated for me. Because I don’t do well in the heat and humidity. I don’t. But if braving those seasonal perils means that I get to stand outside with fire and (vegetal) spears, then — well — maybe a little bit of summer is worth it after all. 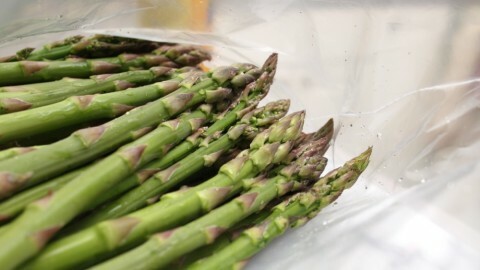 Trim the woody bits off the bottom of your asparagus, then add the stalks to a one-gallon ziploc bag, along with all the rest of your ingredients. Toss to make sure that all the asparagus is thoroughly coated, deflate and seal the bag, and marinate in the refrigerator for at least three hours. Heat your grill. If you’re using charcoal, you’ll want to bank your coals to facilitate indirect-heat cooking. * If you’re using a gas grill — well — you may be on your own. 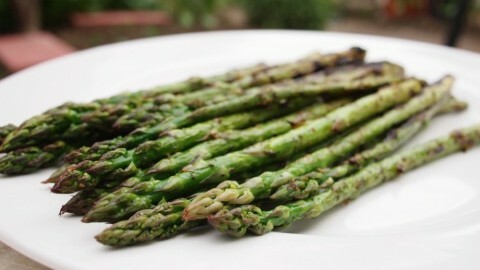 When the grill is hot, remove the asparagus to a platter, making sure to pick out the garlic. 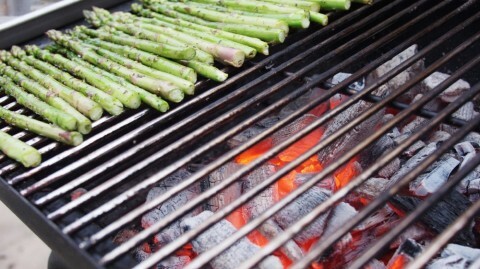 Add the asparagus to the indirect-heat side of the grill, head-side facing away from the coals. Cook, turning periodically, until the stocks have just a tiny bit of snap left to them (5-10 minutes). Then remove to a platter and serve with one more squeeze of lemon juice over the top. As you’re cooking, remember — don’t crowd the asparagus. You want them all cooked over indirect heat, and if that means doing them in two batches, there’s nothing at all wrong with that. * I would strongly suggest using a chimney starter rather than lighter fluid. You get a cleaner burn, with fewer off flavors and fewer toxic chemicals in your food.